We like to give back to organizations that align with our philosophies. 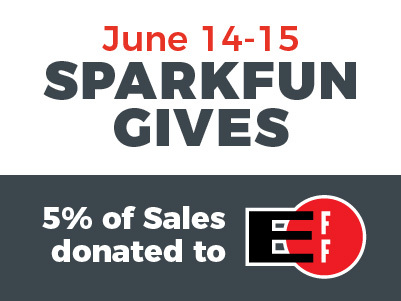 On Thursday, 6/14, and Friday, 6/15, SparkFun will take five percent of our customer sales and donate them to the Electronic Frontier Foundation. EFF is a non-profit that advocates for defending civil liberties, protecting user privacy, promoting free expression and safeguarding innovation in the digital world. Yes, I know this mean we should probably have called it SparkFun Gives Days, but that didn't sound as good. So if you're looking for a way to give back to an organization that's fighting for things like net neutrality, your SparkFun order this Thursday and Friday will help support one. If there's nothing you need from SparkFun right now, consider donating to the EFF yourself. Are there any other digital or electronics-based organizations you think we should donate to in the future? Let us know in the comments. Thanks for reading and have a great day! Have to love a company such as SFE where the management metaphorically puts on the work boots every morning and builds something they believe in; but as much as SFE is loved and respected, will have to disagree on this. The EFF has been the recipient of millions USD annually, with no tangible results other than public awareness of some important issues. There are two big tech issues of our time: net neutrality and encryption/privacy. And other than the EFF's frequent amicus curiae briefs for high-profile stuff, am not certain that much has trended away from the Dark Side. EFF principles are mostly lawyers, and are located in Silicon Valley and in the beltway. This is called 'living in a bubble'. Until last year, donated $100 pr annum for 13 years to the EFF. My EFF support ended with their lionization of Chelsea Manning. Hence, this year, all of my donation money will go to the FSF. Suggest the Free Software Foundation and Software Freedom Law Center. Do not care that Stallman is an eccentric crank, as he is not disingenuous and is interested in fighting the good fight to the bitter (and bitten) end. Join us for the SparkFun Open House!